Elizabeth is a busy mom of two and has made getting to the gym a priority over the last year. Yes, she often stares at me and maybe rolls her eyes when I tell her she can lift more LOL. But then she does it! We’ve been working on pull-ups (and me convincing her that she could do it!!) for a while now. 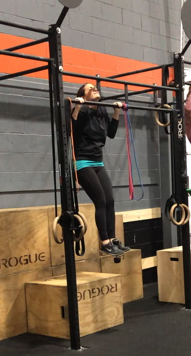 So stoked to see her rock out NOT only her very first body weight pull-up, but also a weighted one shortly after (pictured above) during the last couple week’s of max testing. Girl, you are so strong inside and out- so pumped to see your progress, not just with pull-ups but with everything!!! Love having your smiling face in class!